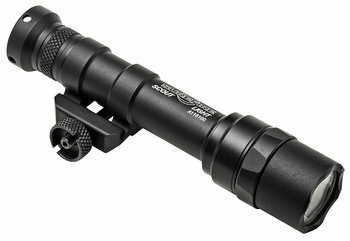 Compact and extremely powerful, the M600 Ultra Scout Light® uses a high-performance, virtually failure-proof LED to produce 500 lumens of blinding output, and it continues producing tactical light for 1.5 hours on a set of batteries. This model is identical to the M600 Ultra Scout Light but does not include a remote tape switch. Its output is focused by a Total Internal Reflection (TIR) lens into an intense, far-reaching beam that also provides significant peripheral illumination, making it ideal for close- to longer-range applications.